What is a bond ladder and why should you follow this advice? Your investment portfolio should have a mix of cash, bonds and stocks in it. The percentages of each will depend on your goals, your age, time to retirement and your risk tolerance. Maintain diversity in your portfolio. Most investors will not be caught losing a lot of money if one company or one sector does not do well and tanks in terms of value. Own bonds is one segment of this diversity component. More importantly you can protect yourself in the bond market as well. This article is about bonds specifically and how you should always ladder them. But first we suggest bonds from good quality companies, blue chip and paying decent interest rates. Which at the time of writing this article is only around three or four percent. You will want to make sure that your bonds are from several companies and / or governments to provide diversity. Lots of companies and even some governments have not done so well of late. You definitely do not want to have all of your investments in one place. Next they should have maturation dates that are staggered. 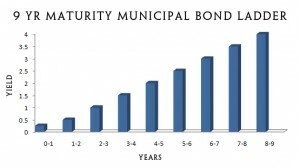 In other words if you had ten bonds, each at $10,000, ideally they should have maturity dates that mature each year going out 10 years. This way you have only one bond maturing every year for a total amount of $10,000. Your average interest rate will move up and down based on the direction the market is going on interest rates. Some years the interest rate at renewal time will be high. While others the rate will be lower. Either way only a small portion of your portfolio will be renewed in a year. You will be somewhat protected from the fluctuation of interest rates. This assumes of course that you have a longer term investment strategy and are not saving for something specific in the near term. Near term investments would be better off in GIC’s that do not fluctuate in value and pay a fixed low interest income for various maturation’s. They can be purchased in 30 day, 6 months and 1 year maturation’s, but traditionally have not paid a very high interest rate. 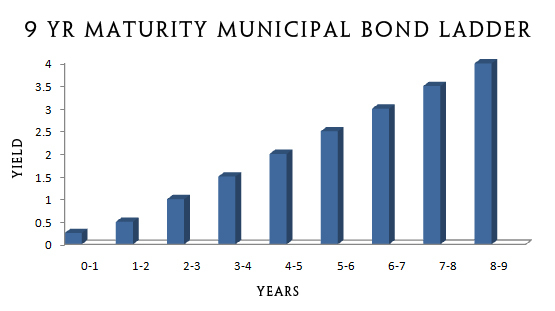 Bond ladders that are invested across several companies with various maturation dates are the best way to protect your long term investments from the always changing market. In the worse case, you do not want to have to cash in all your bond investments to live on in retirement when your bond value has dropped. Interest rates have risen, or your bond is worthless because the company went bankrupt are examples. Laddering them and sticking with blue chip companies will help to ensure that you never face this reality. There may be higher interest rate bonds available. However always evaluate the risk of your principle being there when the bond matures. Also the risk of always receiving your interest payment every month or every six months depending on the type of bond that you have. Some bonds will be callable. Which means that at a certain time, the company can cash in the bond and return your principle along with accrued interest to you. They usually will do this at a time when interest rates are lower than what they are paying on the bond that you own. They can borrow money at lower rates and reduce their overall cost of borrowing money by doing this. If you are buying corporate or municipal bonds always confirm if your bond is callable or not. Most investors do not like surprises. This can be one surprise you may not want to have. When the bond is cashed, you do get your money back, but now you have to invest it at a lower interest rate which is not always to everyone’s liking. For more information on bonds and bond ladders, click here.